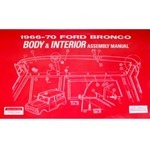 This manual is perfect for those frame up restorations. Shows detailed diagrams and blow-ups of the various body pieces (fenders, grill, doors, tailgate, etc...) and trim (chrome molding, emblems, etc...). If you don't know where something goes or how it goes together, chances are this book will have what you need. The year range is 66-70 but most of the book could apply to 71-77 also. The detailed drawings just what I needed to help compliment my frame off restoration. Information in this manual is very helpful and will be of great use to some do a restoration project. It will greatly help if you have parts missing and are trying to figure out what was missing. If you are doing a Concours restoration, you will need this book or at least the info in it. It has details down to the size of the sealer bead when joining pieces. Some good info on the changes between years, inside door mechanisms, bench seat versus bucket, etc. 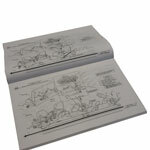 If you are looking for dimension specs for replacing body sheet metal parts, this manual doesn't have the info. I am looking for info on sequences for joining sheet metal components and tolerances for door openings, etc.